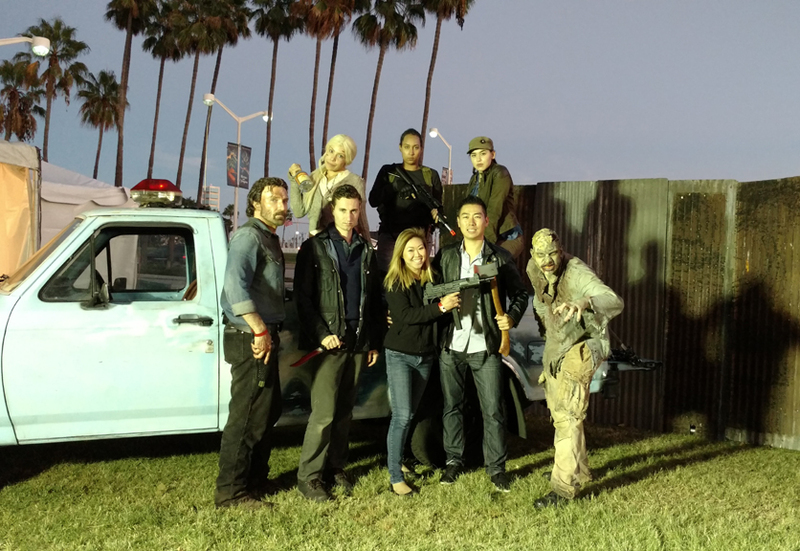 2016 is our first opportunity to visit the Long Beach Zombie Fest. 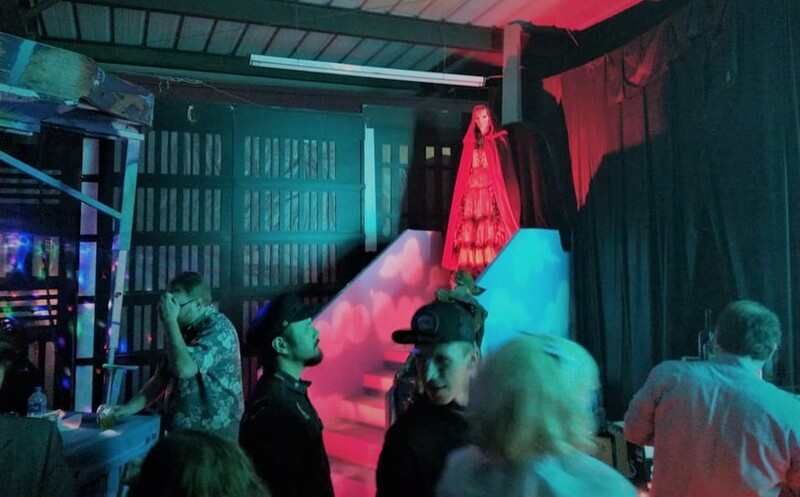 Though it takes place every October, this festival is not billed as a Halloween event; nevertheless, it should appeal to Los Angeles horror fans looking for something different during the Halloween season. 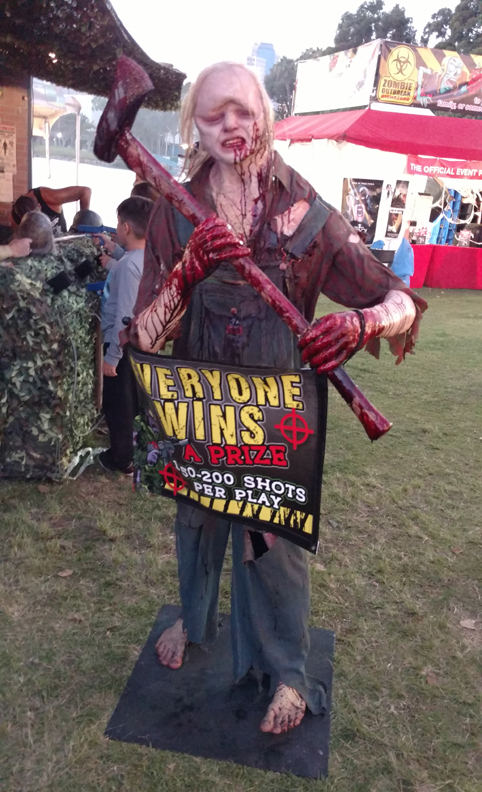 This is an event with multiple attractions: i.e., a small themed fair where everything zombie-related is celebrated, and attendees are encouraged to dress up as the living dead. 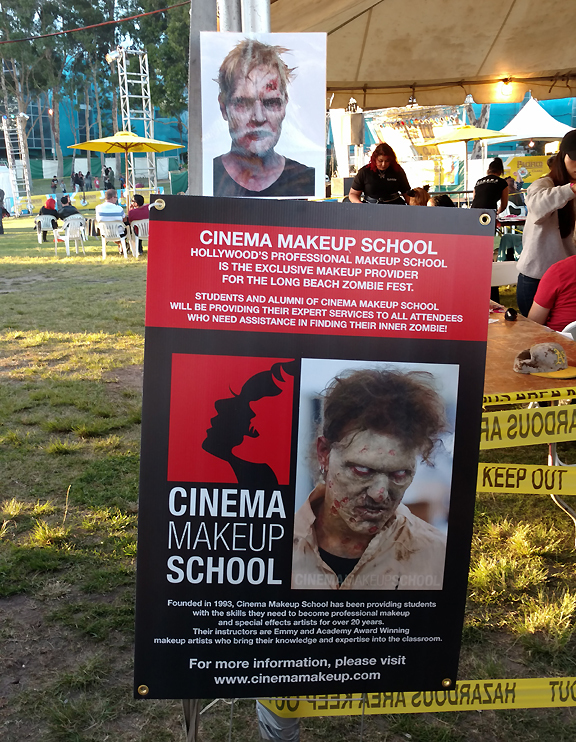 If you do not have your own make up, free services are provided by the Cinema Makeup School. 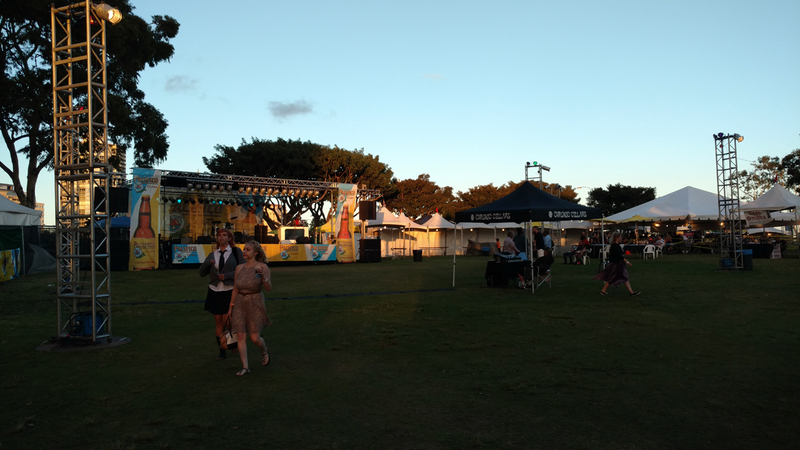 Admission is a reasonable $15, but there are surcharges for some activities on site. 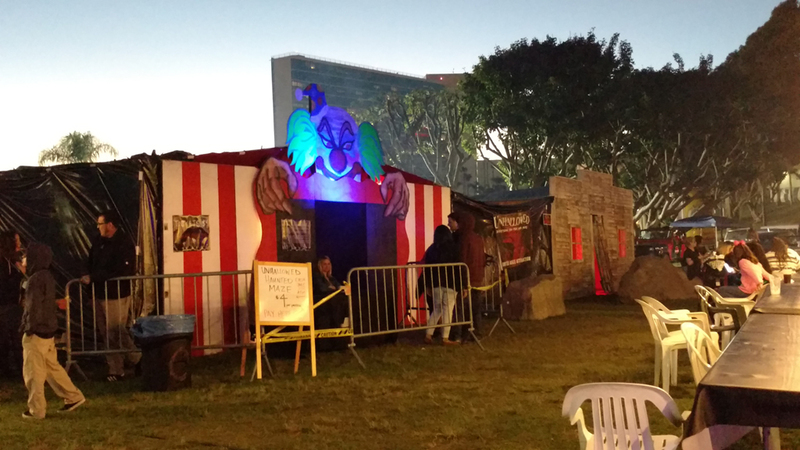 Long Beach Zombie Fest 2016 takes place at the Rainbow Lagoon Park. There may be sources that list the address as Shoreline Village, which is actually across the street. 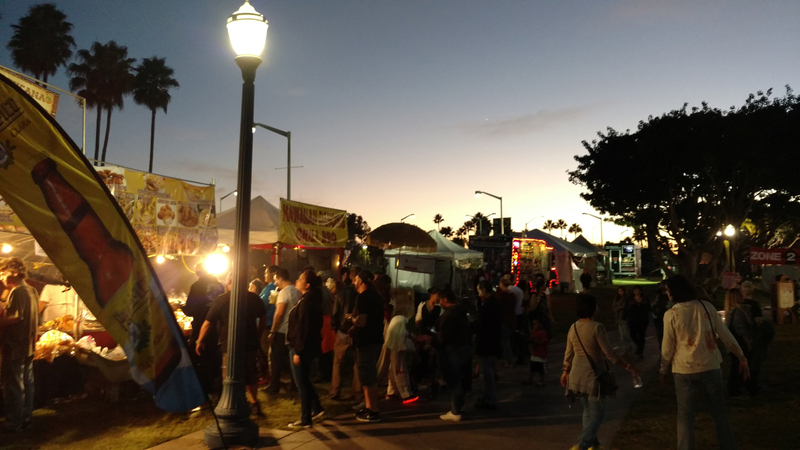 Guests may park at Shoreline Village for a small fee and get their parking validated with a small purchase, or they may park at a pay lot also across from the Rainbow Lagoon Park, but there is a 2-hour maximum limit. 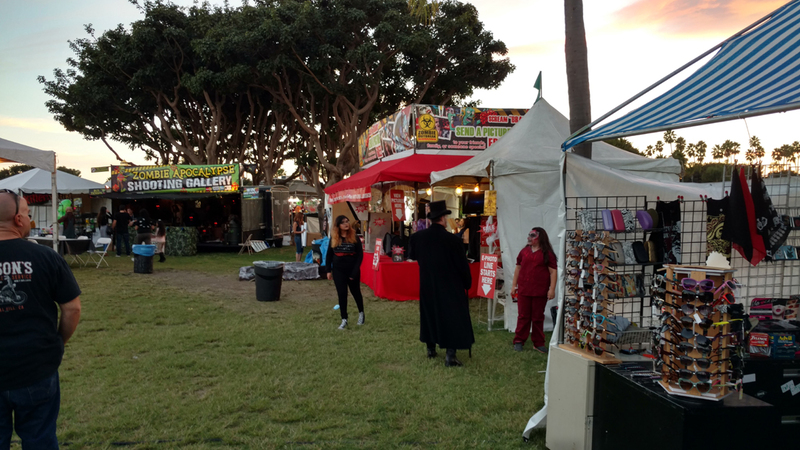 Once we entered, we saw a variety of vendor booths to the left, a painting vendor in front, and the free zombie makeup vendor to our right. Beyond that to our left were: The Walking Dead Interactive Experience, a 5D Virtual Ride, Costume Contest Stage, a meet-and-greet booth for Vincent Ward (Oscar from The Walking Dead). 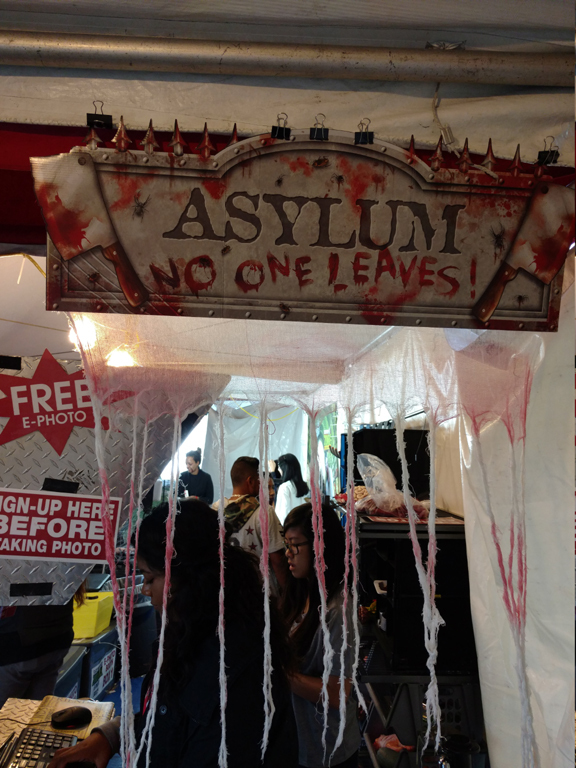 The Unhallowed Maze, Zombie Shootout Gallery, Zombie Survival Experience, Zombie Fest Photo Booth, and Performance Stage were all scattered around the Lagoon making this a “fair-like” experience. DEAD END: Unhallowed is a 3500 sq. ft. 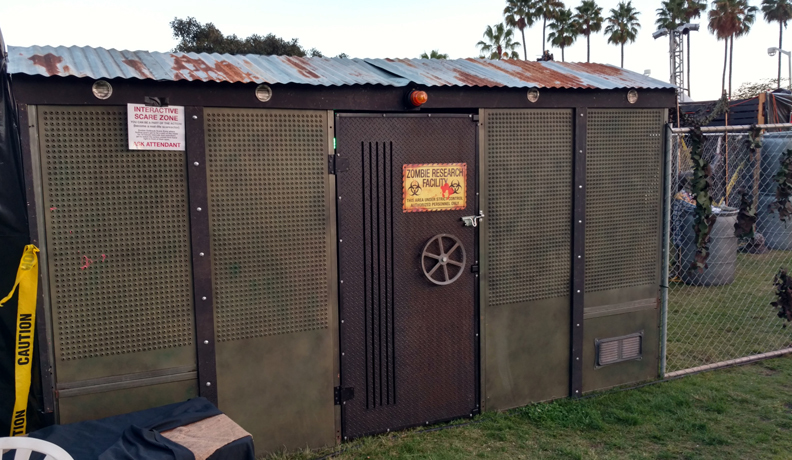 Haunted Maze Attraction with Zombie Interactive Outbreak Scare Zone. We entered this maze while the sky was still sunny. 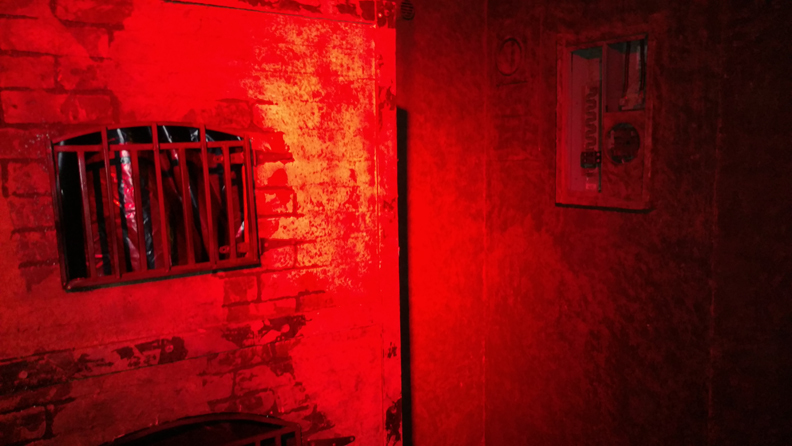 Though it probably didn't have the same effect as it would have had at night, the staff was able to adjust and produce surprises and jump scares. 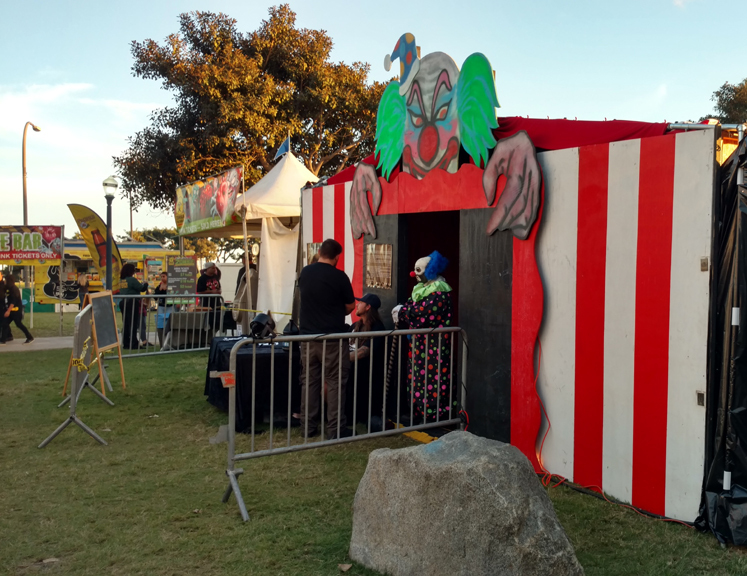 Though we couldn't figure out the specific theme, the entrance looked like circus fun house with a killer clown on the loose; later, the maze transitions to a quarantine themed area with zombies. 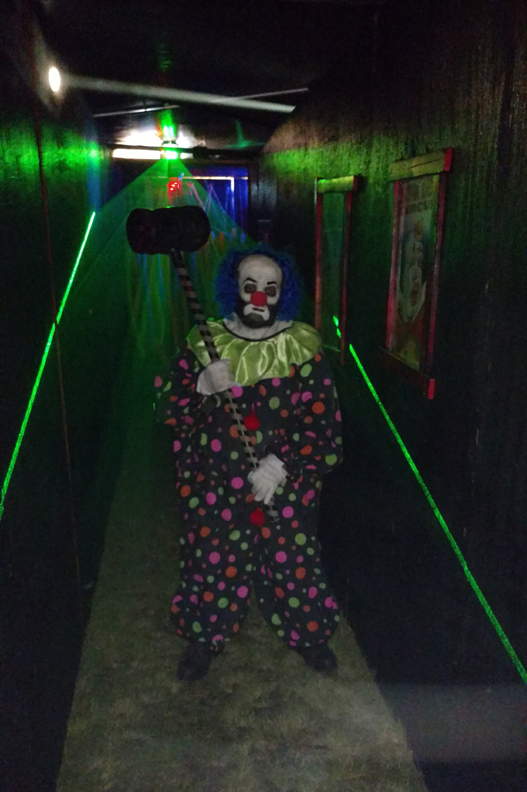 After we survived the killer clown, we saw a severed clown's head, toxic bins, and walls painted in psychedelic circus colors. After a short trip outside, past various crates and scarecrow figures, we were confronted by a character with an alien torso and mask. 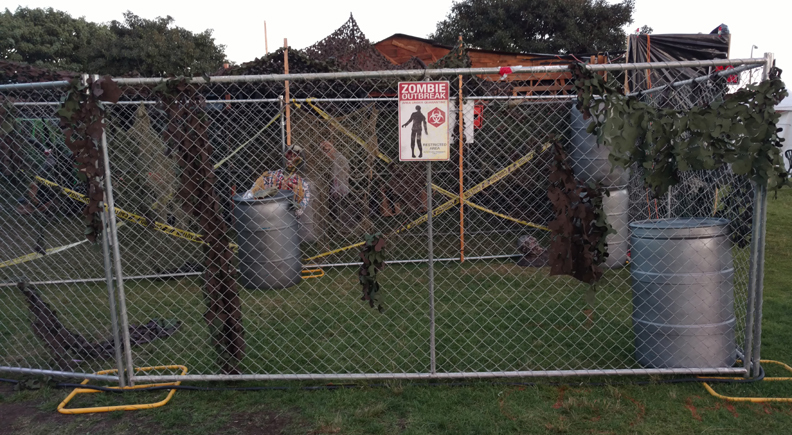 Then we exited again and approached what looked like a zombie quarantine area (presumably the outbreak interactive zone) with toxic bins, decapitated heads, and bloodied bodies hung on the fences and vines. After being attacked by a zombie butcher, we found ourselves in a room with zombie babies displayed on a wooden shelf. With our attention diverted not only by the babies but also by the butcher, who was still pursuing us, we totally did not see a second zombie sneaked up on us: I felt him hit my arm, but my guest was not aware of him until she turned around and it was too late to do anything but scream. Continuing, we found ourselves in room with bloodied body bags hung from the ceiling. The zombies from the previous room trapped us here (hence the name “Dead End,” I guess). Fortunately, after a few seconds, they deemed us not worthy and allowed us to leave. 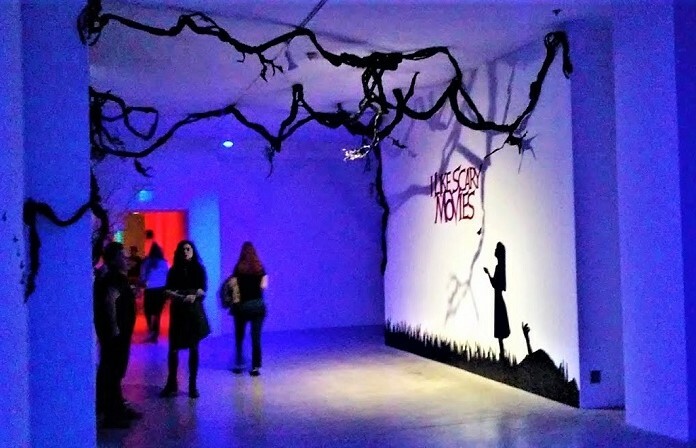 The maze was impressive with very unexpected jump scares. The zombie outbreak area looked even more impressive on the outside; it resembled something out of a zombie movie or even The Walking Dead. 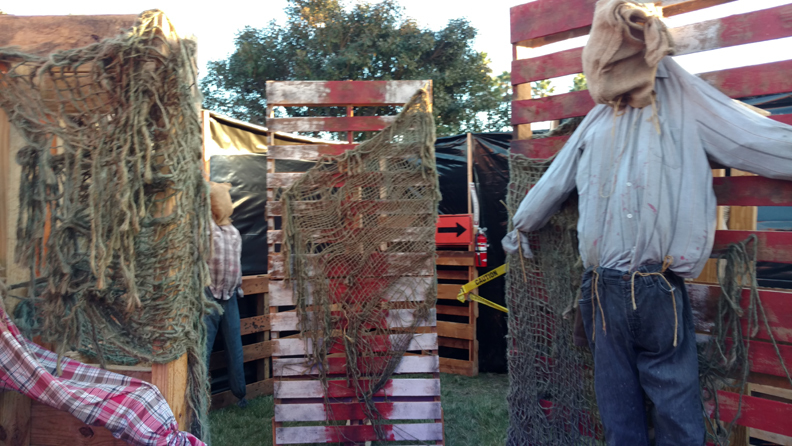 Though there were clowns, scarecrows and zombies involved, still you had to wonder if each turn would lead to a...Dead End. The Walking Dead Interactive Experience featuring the infamous Walking Dead Reel Guise Cosplay: Fans of the show got to participate in a live set group photo and/or video - yes VIDEO, with cosplayers filling in for the cast. A staff member asked which would you like to do and then requested your camera or phone. We chose to do both. Before the record button is hit, the person playing Rick Grimes coached us on what was going to happen. “Rick” said that we would be hanging out and having a normal conversation until another actress from the group spotted a walker. Then I got to kill the walker. It was definitely a fun keepsake and experience. Not to mention, the zombie's make up was spot-on. 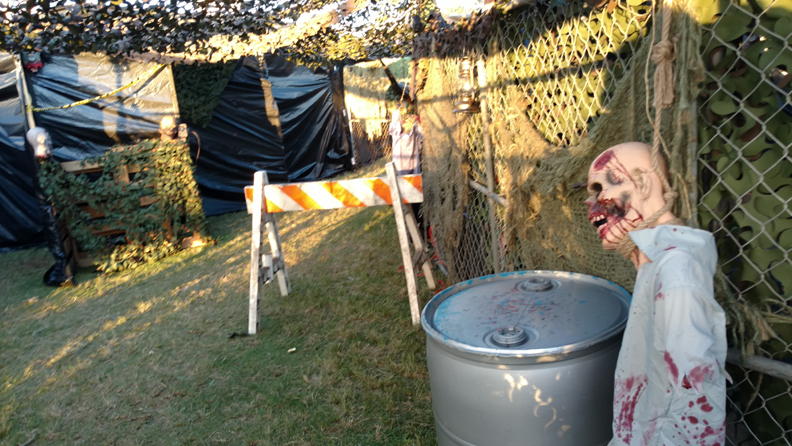 Zombie Tactical Response Training Base: Flag Football with Zombies! This free attraction put you in a team wearing flags on each side. The goal was to battle through a horde of zombies and, led by a trained solider, lay hands on a truck which was the designated safety zone - before a horn sounded, signaling the time limit. The weapons provided were soft, so no scare actors were harmed in this process. 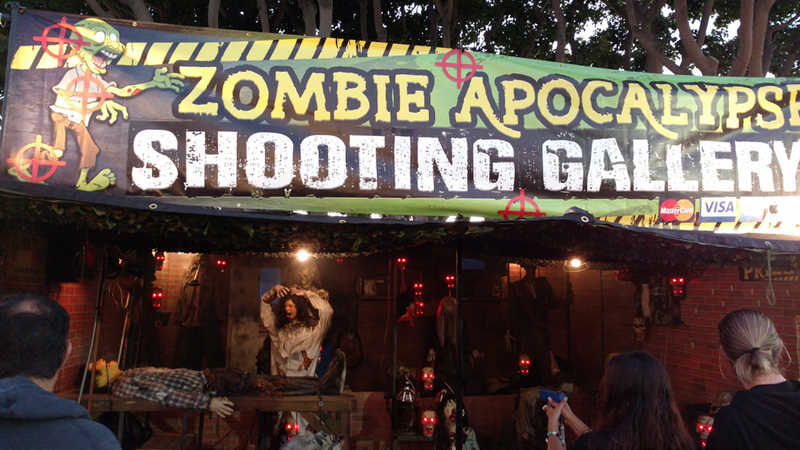 Zombie Apocalypse Shooting Gallery: Guests got 150 to 200 shots at moving props in a vast and detailed zombie display. 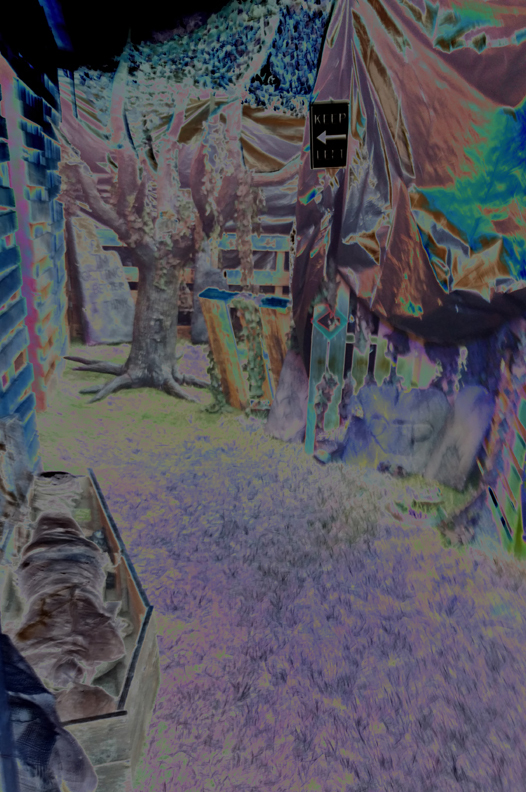 I was able to hit a few targets which created smoke/fog, turned on a light, and caused a zombie to lunge toward us. The detail of the decorations and animatronic effects made this a worthy attraction. It cost $5 to play, but everyone was a winner, receiving a prize no matter how well or unwell they shot! 5D Ride: For $10, guests can hop inside a 5D Virtual Reality ride. 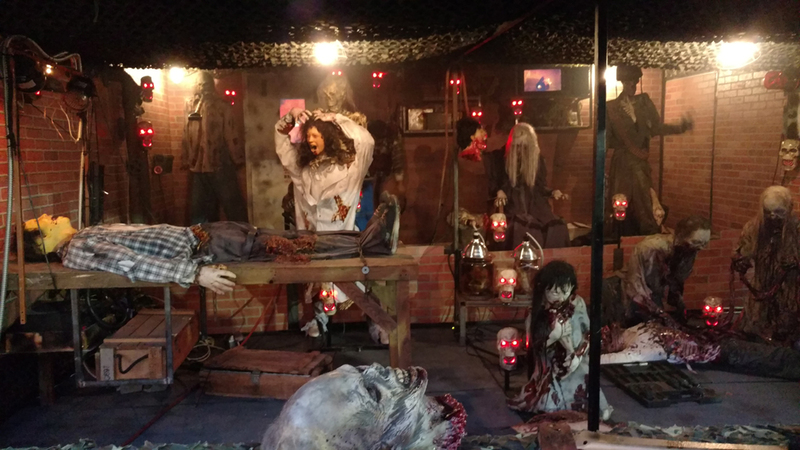 The ride promises to take you on a “Venture into New Dimensions: 3D Visuals, Motion Chairs, Sound and Special Effects (water, smell of decay, fog, lightening, etc) give you a mind-blowing real-life entertainment experience. 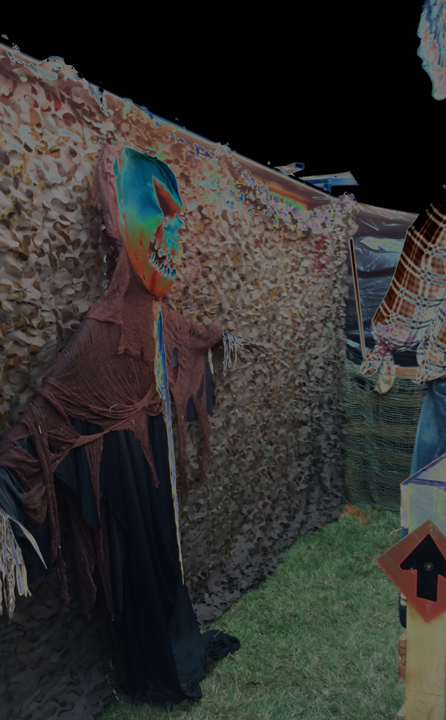 Attraction features Zombie Panic House, Blood Magic, Apocalypse, and Metrofear and more." Fear Factor Experience, sponsored by S.C.A.R. 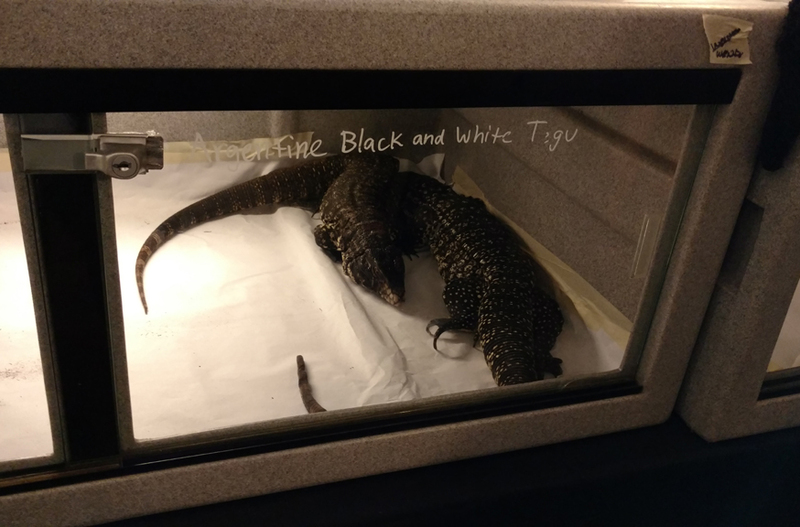 (Southern California Herpetology Association and Rescue): Guests could check out a free display of rare snakes, reptiles, tarantulas and scorpions. Some are for sale. 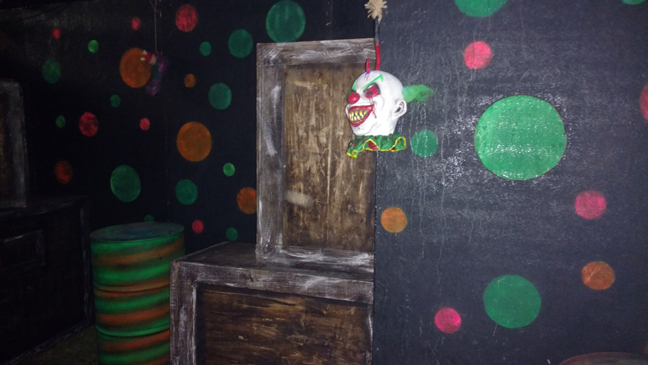 For $1, guests could participate in a Fear Factor activity, which took place behind a curtain: sticking one's hand into a canister, containing cockroaches, worms, or who knows what. 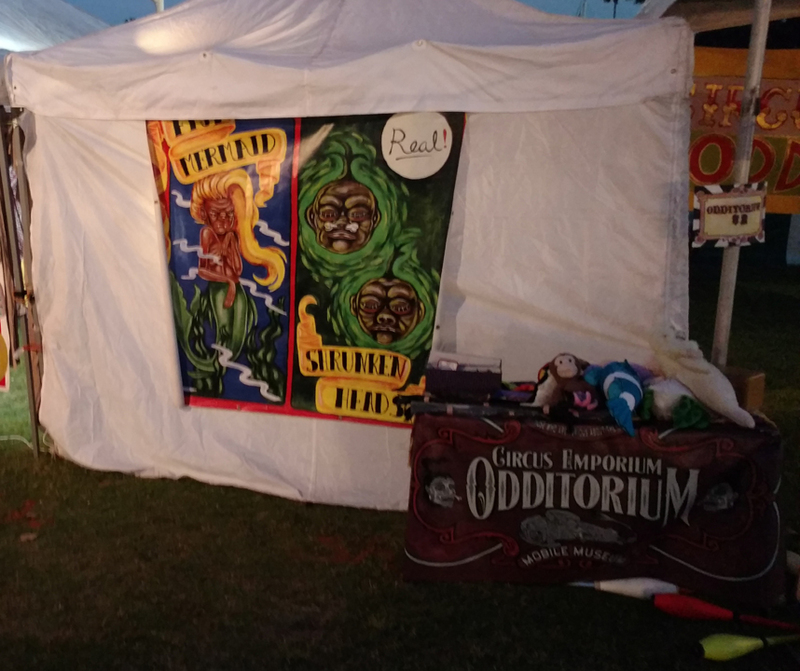 Circus Emporium Odditorium: A Ringmaster asked if you had seen their unbelievable, never-before-seen circus displays: a real shrunken head, a polar piranha, and more. The tour cost an additional $2. 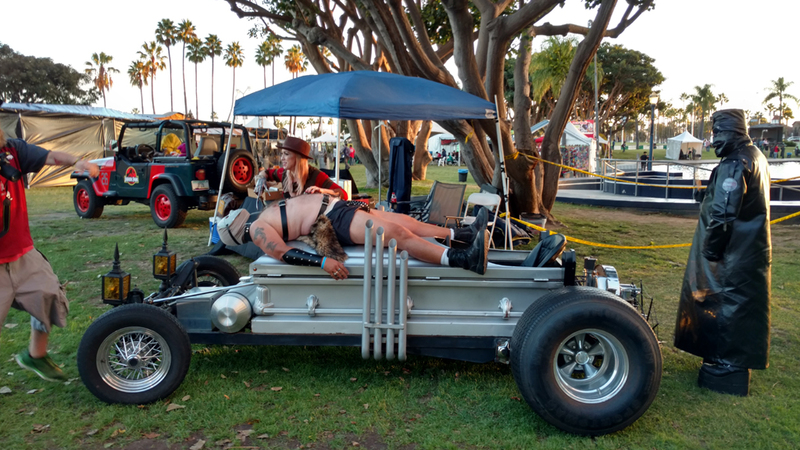 The Notorious Dragula (Coffin) Car: Great photo-op with this coffin hot rod and an executioner. Photo Booth: Attendees got 3 free digital prints with a variety of props on site to handle. Guests also had an option to purchase a physical copy for a small fee. 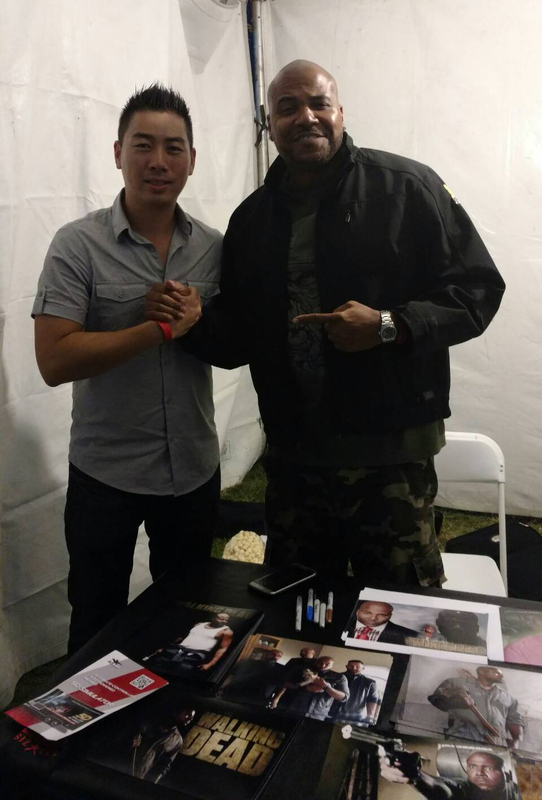 Vincent M. Ward (“Oscar” from The Walking Dead): Participants got to meet and greet this fan-favorite actor from the AMC zombie show. Photos and autographs were available to purchase as well. 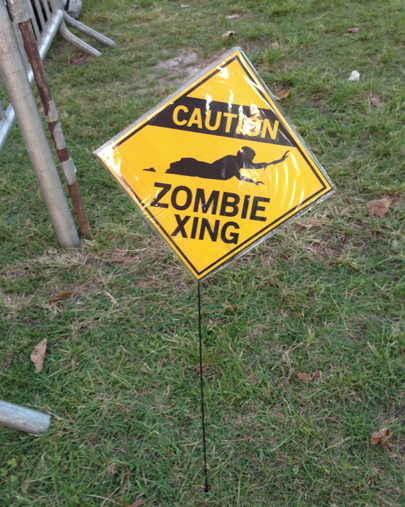 The Infamous Zombie Walk: took place on all three days of the fest this year, spreading zombie fever around the nearby area. 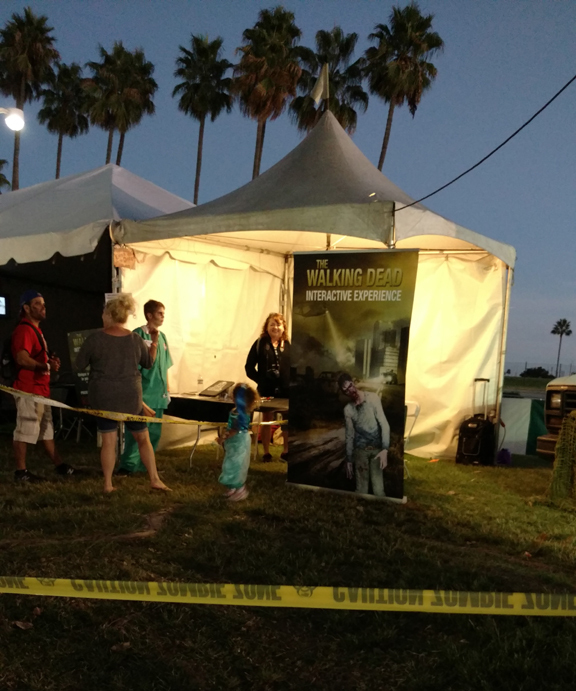 Overall, the Long Beach Zombie Fest 2016 is a good event to visit for a few hours if you are in the Long Beach area - worthwhile even if you only want to participate in the activities included with General Admission. If one were to get free make up, join the Zombie tactical response activity, take part in The Walking Dead interactive experience, compete in the costume contest, party and dance near the stage, or just simply walk around in costume and admire the other people dressed as zombies, it would be worth the price. 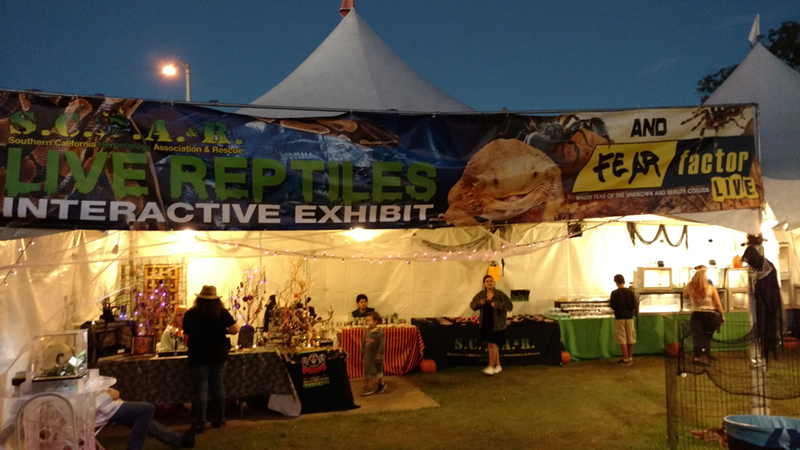 As a bonus, Shoreline Village, across the street from Rainbow Lagoon, has its own independent Halloween maze. 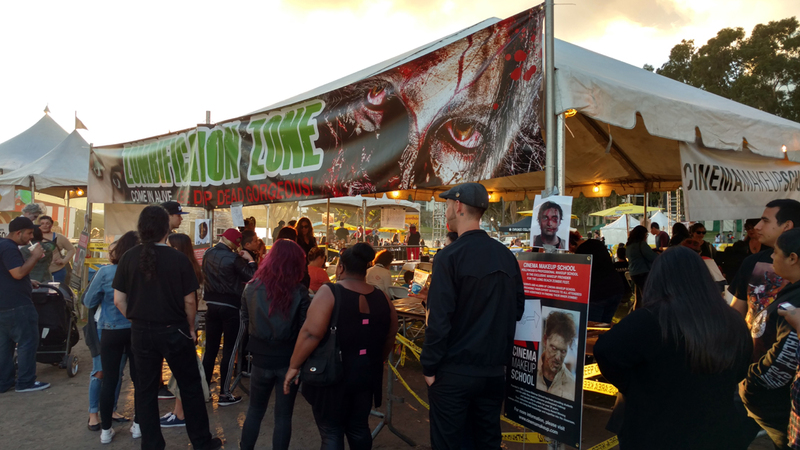 Since the path of the Long Beach Zombie Fest's Zombie Walk led through the village, there was ample opportunity for cross-pollination, as random zombies could be seen lurking among the shops. 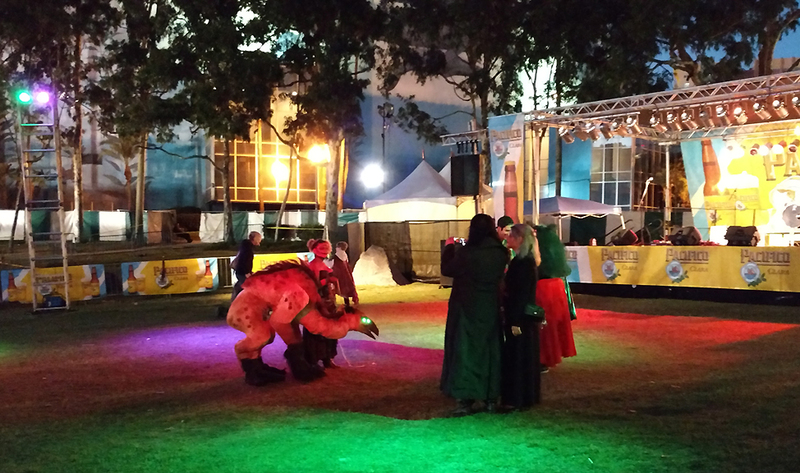 Where else can zombies roam from a park to a shopping village and not have startled passersby gawking in shock? 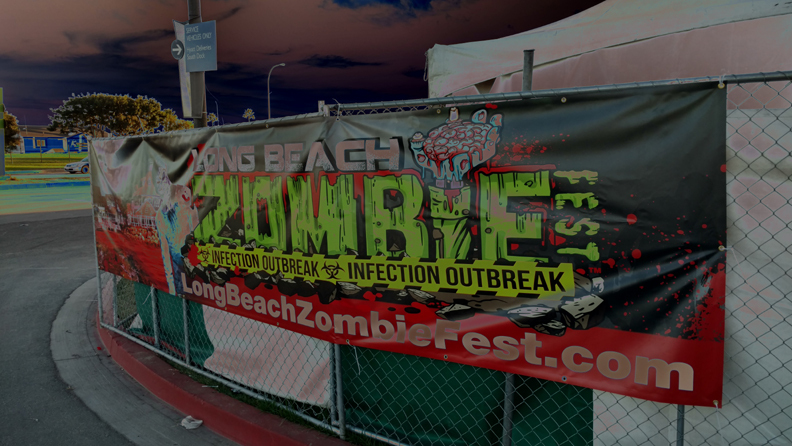 Next year's Long Beach Zombie Fest will take place on October 13 through 15 at the Rainbow Lagoon, 400-403 Shoreline Village Drive in Long Beach, CA 90802. 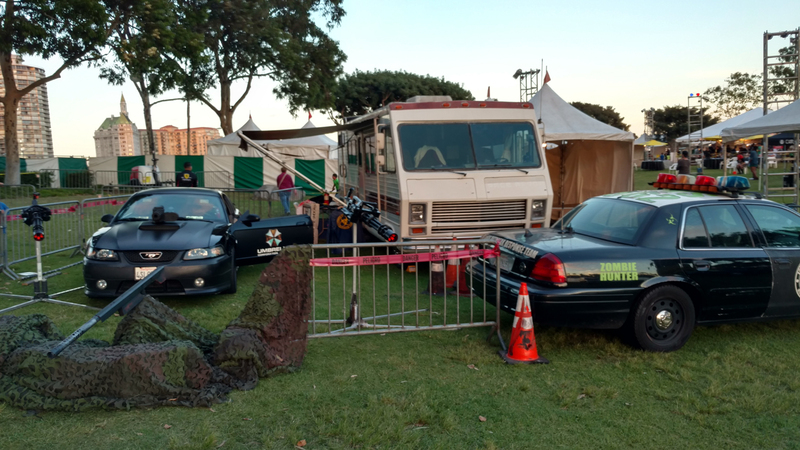 For more information, visit: longbeachzombiefest.com. Click on any image to open a slide-show the photo gallery below. All images copyright 2016 by Warren So. February 25, 2008 Steve Biodrowski Comments Off on Ray Harryhausen - last chance!